One reason is because Carlson, who has bumped around conservative journalism and cable news since the previous century, has hit his stride since taking over a nightly prime-time hour on Fox in November 2016. Carlson regularly contends with Rachel Maddow of MSNBC for the second-best ratings in all of cable news, behind only Sean Hannity. Carlson, a rich kid from La Jolla, isn’t a populist outsider by upbringing or personality. His father was a Republican ambassador and his stepmother was an heiress and a niece of Sen. William J. Fulbright (D-AR), a leading insider opponent of the Vietnam War. A witty man, Carlson seldom pretends to be anything other than a member of the elite he insightfully criticizes. 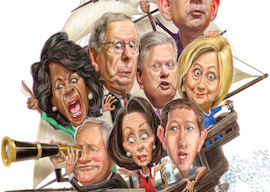 The funny thing is that Carlson, a lifelong Republican, has drifted leftward on economics and foreign policy in recent years, as seen in his new best-seller, Ship of Fools: How a Selfish Ruling Class Is Bringing America to the Brink of Revolution. Why do we tax capital at half the rate of labor? Carlson’s book is particularly derisive of neoconservatives who didn’t learn from that disaster, such as Max Boot, Robert Kagan (who “seemed like an aging linebacker with a history of concussions”), and his old boss at The Weekly Standard, William Kristol (who has just now called for America to plot “regime change in China”). The signature characteristic of America’s foreign policy establishment, apart from their foolishness, is the resiliency of their self-esteem. Carlson lists all the countries Boot has called for the United States to attack: Afghanistan, Iraq, Syria, Iran, North Korea, Saudi Arabia, Pakistan, Somalia, and Libya. Still, Boot continues to fail upward. Ship of Fools is full of appreciations of liberal heroes of the 20th century, such as Ralph Nader, Frank Church (the Democratic senator who helped bring the American deep state under some degree of legislative control in 1975), and farm labor leader Cesar Chavez (a fervent opponent of illegal immigration). A fly fisherman, Carlson is happy to admit that 1970s environmentalists did wonders for cleaning up polluted rivers. And, he points out, the famous 1971 “crying Indian” TV commercial persuaded Americans to be ashamed of littering. Today, however, environmentalists have lost interest in down-to-earth issues like littering and would never dream of being so racist as to try to shame picnicking illegal immigrants into picking up their used disposable diapers. Now when Carlson goes fishing in the Potomac, the water is clean but the banks are filthy. The majority of journalists and intellectuals in 1975 would never have accepted the lame excuse that silencing, firing, and ruining people for holding an opinion was fine, as long as it wasn’t specifically the government doing it. They would have declared that a free society depends above all on free minds. ‘Between the World and Me’ is an unusually bad book: poorly written, intellectually flabby, relentlessly shallow, and bigoted. No honest reader with an IQ over 100 could be impressed by it. One presumes that the moment America wakes up from its current fever, Coates’s memoir will be forgotten immediately, an embarrassing relic from an embarrassing time. I have no idea how Carlson creates five hours of television per week and writes a book at the same time, but Ship of Fools is quite good. It’s currently No. 3 on the nonfiction best-seller list, behind Michelle Obama and Bill O’Reilly. His prose style is simple and clear, which is helpful because the density of his ideas is rather high. It’s not a large book at 244 pages, but it might take longer to read than you expect. At the moment, the coalition of identity groups has held together because it is united in a single purpose against white male power. But rapid demographic change makes this unsustainable. When the traditional scapegoat becomes insufficient, various factions will turn on one another. Still, Tucker Carlson will likely be around for quite some time to drive mobs into further rages with his honesty and wit.